As it turns out, all you need to turn the Rabbids from an over-saturated Minions-esque property into one that's accepted by open arms is a Princess Peach wig. Who knew? 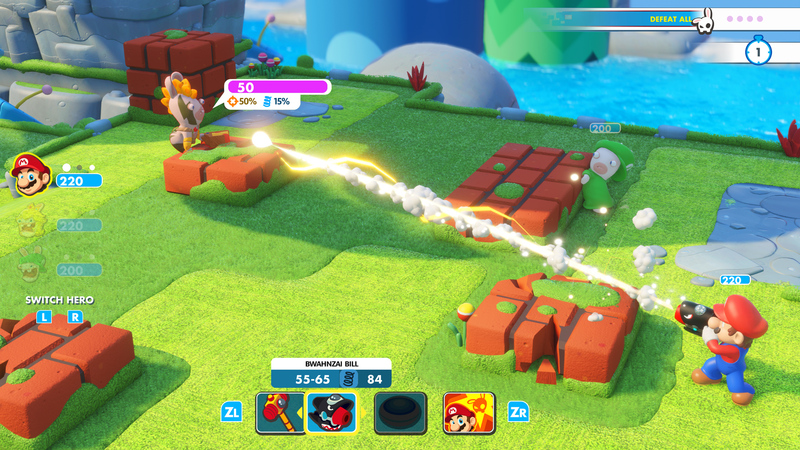 Mario + Rabbids Kingdom Battle exploded on the scene earlier this year, capped with a heartfelt appearance by Mario creator Shigeru Miyamoto at E3, and people have been high on it ever since. After the curtains fell, I am too, for the most part. Creating doppelganger versions of Nintendo's own fab four is genius. It's a move that allows Ubisoft and Nintendo to get a little more creative with their personalities rather than once again push out the stoic Mario and sweet Peach. Now, their Rabbid equivalents are boastful and exhibit sociopathic tendencies respectively. Ubisoft found a way around Miyamoto's stalwart, lock-and-key mentality surrounding his creations. 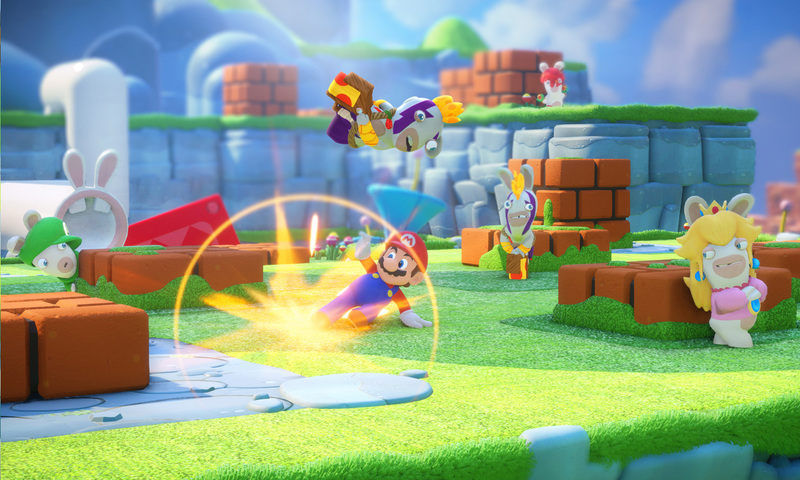 Pretty much every recent Mario narrative has been light on exposition, and Rabbids is no exception. A giant portal appears over the Mushroom Kingdom, Rabbid things emerge out of it, and worlds collide. Some Rabbids are good, some are bad and ally with Bowser Jr., such is life. There's a number of groan-worthy moments that are straight out of the Shrek playbook (slow motion slapstick), but Ubisoft makes up for it by clowning on Luigi constantly or resorting to insult comedy in a way most Nintendo games would never do. There's something eerily satisfying about watching a Rabbid let someone fall to their death and snap a selfie while Mario worryingly looks on in disapproval. Everything is also simple, clean, and cute, in a way that feels up to par with a first-party creation. Rabbid's aim is to ease people into the strategy genre, not scare them away from it with stringent min-max requirements and permadeath. I admire it in that sense, as I play plenty of SRPGs that involve staring at menu screens for hours on end, and even if there's technically an armory of weapons to sift through, you don't really need to do it. That insistence leads to a compromise of fluff. Exploration zones, which are basically just glorified maps that you move from battle to battle on, focus on leading your party in a linear fashion -- figuratively and literally. There's no fun jump ability or depth to it so finding secret bounties feel unearned, and I couldn't stop thinking about how much more interesting they could have been with even an ounce of influence from Mario RPG. There's slight promise with puzzles like chasing red coins and blue coin bonus zones, but there's really no work required to best these portions. The way coins work is also strange. You can earn them piecemeal through exploration zones or in bulk as a reward for doing well in combat, but they come a little too slowly for my taste. Given that they're used to unlock weapons (and subweapons like drones or hammers) they gate quite a lot of content, and the way everything is earned feels a little off. Weapons are acquired through chests, some of which are off the beaten path, leading to odd scenarios where you just spent your entire savings on a rifle only to find a better one five minutes later for the same price. It's not something that actively pissed me off, but it's a questionable mechanic as I was constantly hoarding my cash instead of buying cool new items to experiment with. None of these complaints are deal-breakers though, and a lot of my concerns melt away when I'm in combat. I love how distilled everything is without feeling dumbed down, as the typical grid-based movement and attacks are all there, but with some tweaks from various SRPGs over the past two decades. The drive-by slide that can be enacted during the movement phase is satisfying as hell, as is the power to blow apart cover just by aiming at an enemy behind it -- it cuts down on the tediousness of hiding on all sides. Skills also have turn-based cooldowns (no mana system), and even if a few are similar (shields are a commonly shared power), most of them do stand out and are assisted by wonderful dynamic camera angles that aren't drawn out. A fast-forward option on enemy turns is pretty much all I need, and there's shades of Disgaea in Rabbids when boosting movement off teammates. Movement becomes more important in Kingdom Battle than a lot of other SRPGs because of how easy it is to get around, so long as you have your team set in the right places -- and it only gets more complicated when you unlock double boosts. The best part is that there's no stringent movement, ability, or attack limitations. They can be executed in any order and none of them automatically end your turn. You can chain drive-by melees into jump boosts, get to higher ground from the resulting leap, blast an enemy, trigger a counter-attack power (Overwatch in XCOM), then blast them with your attack. If your weapon has the ability to make them move it'll then trigger your counter. Add in a status effect Cleanse/Esuna (pick your poison) with boost jumps (read: it doesn't take up an ability or turn) and things get even more complex. If all this sounds like too much you don't need to fret, as there's an easy mode that increases your health for each battle if you really get stuck. You will, too, as bosses or even elite enemies have a ton of health and can dish out lots of damage if you're caught out in the open. You can't just go into every situation with the same mentality -- you have to adapt to the map and the enemy types. Other than the campaign there's some challenges to embark upon (which didn't really catch my interest), or a limited co-op mode. I'll be honest here, it's nice that they have it, but it's a little strange given that the story is single-player -- you'd have to catch your partner up to speed with your happenings unless they've played it. The learning curve isn't too steep (which is part of its charm), but I wish drop-in/drop-out multiplayer was just fully integrated.